I started with two coats of China Glaze Pelican Gray as the base. The stripes were created with a nail art brush and China Glaze Recycle. I used a dotting tool and Zoya Sweet for the nose. For the face, I used a product that was new to me, a MASH Nail Design Pen. These pens come in six colors and have a fairly sharp tip for fine details. After you get the polish flowing, it's easy to maneuver (just like drawing with a marker) and produces solid color. My lines aren't perfect, but I'm sure that comes with practice. I have a few more colors and can't wait to try them in other nail art. 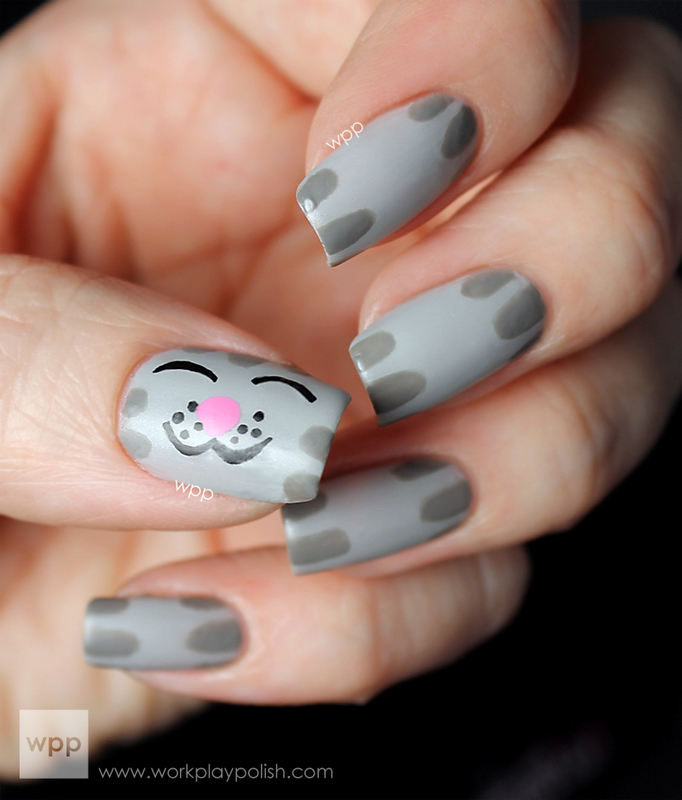 I finished the look with one coat of MASH Matte Polish because, well, kitties aren't shiny. The polish gave it a nice flat sheen and didn't smear any of the design. Don't forget to check out the other Digit-al Dozen geeky masterpieces!